Considering it was a month ago now I'm hoping that this is the last time I mention Easter. This recipe wasn't something I made for Easter but something I made because of it. There's always a small chocolate treat exchange that occurs between my parents/aunts/uncles (but the uncles know they didn't do anything) and their nephews (there is one niece, but she's too fancy living it up in jolly old England to show up for Easter :)). Typically this exchange is a few chocolates of varying types to each nephew, but on this occasion my aunt (the same one married to this guy :)) handed me a baseball bat sized Toblerone and said "it's for baking". I was stunned. I know it might not seem it (to a lot of people) but I like to swear. A lot. In some situations I believe that these words are the only ones that can effectively express emotion. However, I try to keep it to a minimum during family events. And then I checked the Toblerone's nutritional values. Out of shock I shouted HOLY FUDGE! Only I didn't say "Fudge." I said THE word, the big one, the queen-mother of dirty words, the "F-dash-dash-dash" word!" :) (+3 to Awesome if you know the reference). My aunts were shocked and proceeded to break out laughing. Like I said, it's not unusual for me to swear, just for them to hear me do it :). To be fair it's not the larget Toberlone I've ever seen. 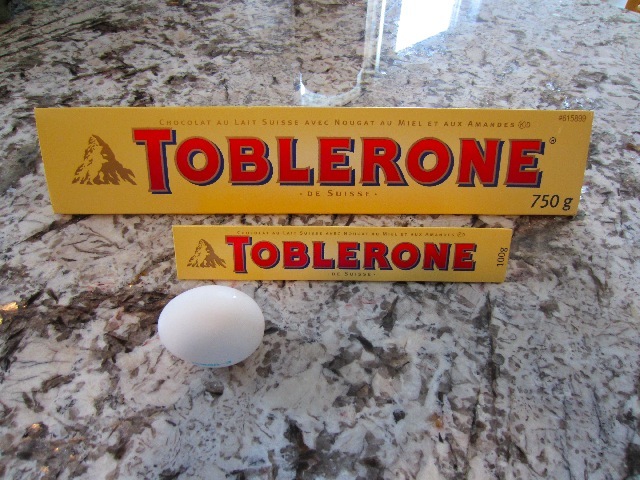 At one point, my friend and his family were the proud owners of a four foot Toblerone (no exaggeration) but one triangle of my Toberlone was the equivalent of an entire chocolate bar. It seemed excessive :). But much like the pumpkin challenge a few years ago, I grit my teeth and accepted. For my first Toberlone themed recipe brownies seemed like a natural fit. I decided the easiest and best thing to do would be to slightly alter my Kinder Surprise Brownies. The changes I started with were quite small as there's not a lot to mess with in a brownie. I removed the cocoa powder and replaced the Kinder with Toblerone (duh!). But as the chocolate melted, I just felt it wasn't enough. It occured to me that Toblerone contains pieces of honey almond nougat, which immediately made me remove the sugar for honey. Some cause for concern was the fact that it was the runniest brownie batter I've ever made. It kind of just poured into the pan. But I figured it was too late to mess with anything more and went with it. I have to say when I finally took it out of the oven it looked strange. It had tiny Aero bar-esque bubbles all over it. And the moment I began to cut into it I could see some liquid rise up, leading me to believe that the brownie was underdone. After completely cutting it I knew this wasn't true. 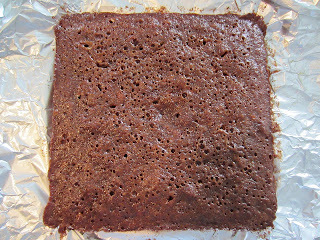 The brownies were also quite sticky and soft but I wasn't really concerned about anything other than the flavour. Day one they were quite sweet. The honey was out front and the chocolate was barely noticeable. 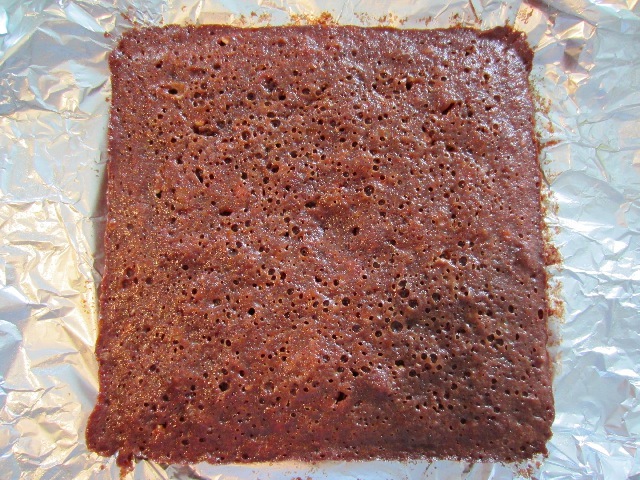 The texture was insanely moist and soft and more cake like then I typically make my brownies. Oh and by moist I mean that there were hints of liquid when you bite down. If it helps, my brother said the texture was similar to a sticky toffee pudding; I've never had one, so I can neither confirm nor deny this. The texture was occasionally broken up by the nougat in the Toblerone, but it was clear that some of the nougat had melted because it wasn't nearly as prevalent as it should have been; some of the brownies had none. My brother also commented that the brownies would have been terrific with nuts and I would have to agree. In the interest of consistency I would use almonds because of the Toblerone's honey almond nougat. And it's barely worth mentioning but the brownies were perhaps a tad greasy because of the moisture. Although even with standard brownies I have found that this is the case when using milk chocolate, even high quality ones. The next day the chocolate flavour was much more pronounced. Day two was when these brownies shined. Not that they were bad on day one, but they were much better on day two. 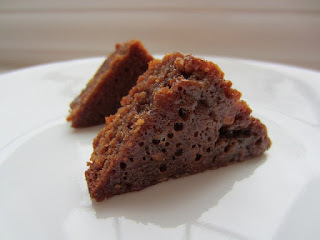 Still soft, super moist and on the cakey but with a much more balanced flavour. This was more of a the Toblerone brownie I expected. These brownies may not be a new favourite, but they were quite good and were definitely different from your standard brownie. I would love to make them again purely to add the almonds, which would cut both the sweetness and the texture. It's not like I'm going to run out of Toblerone any time this decade :). Thanks Auntie C :). Preheat oven to 325F and line an 8 inch square pan with foil and lightly grease. In a small bowl add flour, cocoa powder, and salt. Place a medium heat proof bowl over a pot of simmering water. Add chocolate and butter and heat until completely melted. Remove from heat and set aside to cool. When the chocolate is luke warm, add honey and stir until completely combined. Add eggs one at a time, stirring until combined. Add dry ingredients to chocolate mixture and stir until no streaks of flour remain. Pour batter into prepared pan and bake for 25-30 minutes or until toothpick comes out clean (this took me 27.5 minutes). Remember: a slightly underdone brownie is better than a slightly overdone brownie :). Interesting! I've seen those baseball bat-sized Toblerones in airports. I wonder if they have any other baking applications? I have heard of them being used chopped in muffins and cookies, being used to make saltine brittle or other brittles, fondues, on croissants and so forth, but that's more using them as chocolate chips or a spread. This is the first recipe I've seen that treated them as you would a bar of baking chocolate! 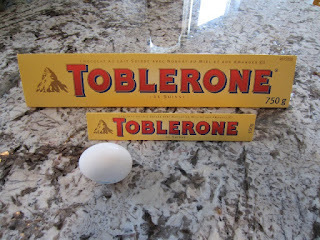 I was so glad go to hear that you were on your way to baking with the Toblerone. Sounds like your first attempt well rather well. Looking forward to hearing of other Toblerone recipes from The Baker's Nuts.